Jewelry is often created for a special occasion or reason to show that the wearer follows a certain sport, belongs to a certain club i.e. 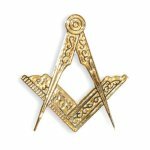 Freemasons, to a certain area or country, in memoriam etc. or a special happening i.e. a coronation, change of seasons, end of war, preventing a war, sun eclipse, a falling star (Haley's comet)…. Peasant or regional jewelry that can imply that the wearer belongs to a specific group, race, faith; with a certain social status; from a specific region; with a status such as rich, poor, unbound, engaged, married, widow etc. Mourning jewellery for various stages of the mourning period (first month, year, rest. pale unpolished black, shining polished black after the first mourning time) also depending on the wearer's financial position.